If we could've pried our fireplace mantel/surround from the wall of our old house and nailed it to the wall here in our new house, we would've! I truly miss it, but, we hope to "beef" up this one a bit in the near future. 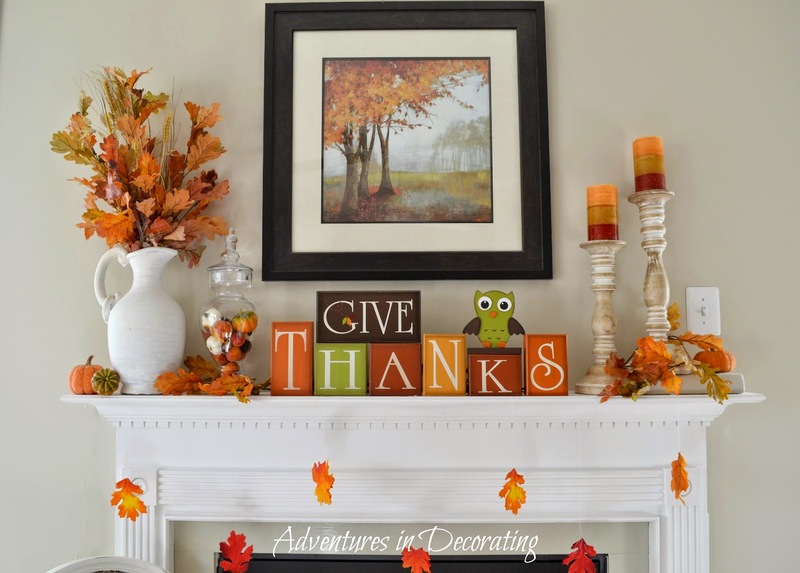 Until then, I can't neglect our simple mantel and had fun adding a few Fall touches to it, with things that I already had on hand ... don't you just love free decorating?! 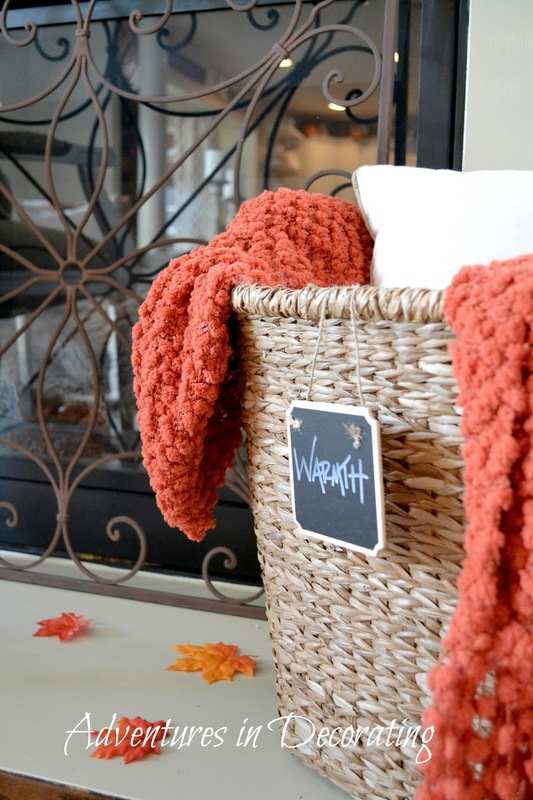 A simple basket becomes the perfect place to toss a few pillows and add a soft blanket, inviting "warmth!" Annnnd, our "falling leaves" made a return, too! I love the soft glow that the lights hidden behind our "GIVE THANKS" blocks, along with the fireplace, give off at night! 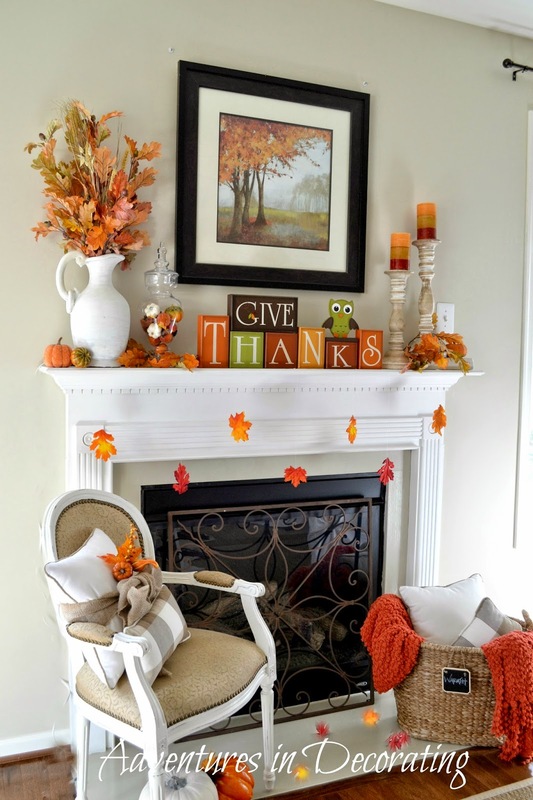 And, "speaking" of Fall mantels, I was very surprised (and appreciative) to see one of Fall mantels (from our old house) included in a fun Fall mantel article from Country Living! Thank you! Now, if you'll excuse me, I have to finish up our kitchen project where the cabinets are now enjoying a lighter and brighter look... yay! Beautiful! Love good finds from Tuesday Mornings! Can't wait to see the kitchen reveal, I just know it's going to be stunning! Looks great Becca. Can not wait to see that kitchen! So pretty Becca...I love the soft glow in that last photo!! Can't wait to see your kitchen...I know it's going to be fabulous!! Smaller but just as pretty, Becca! I am going to hit the attic this afternoon and get some Fall stuff down. Not sure what I'm doing with it yet, but it has been cool here the past few days and it kind of puts you in the mood for Fall. Looks lovely Becca! Can't wait to see the kitchen!! So bright & cheery! I love the basket & accessories, so warm & cozy :)Happy Fall!!! Very Beautiful! Love all of the orange you have incorporated! Love it Becca! Very warm and inviting... Beautiful job as always! 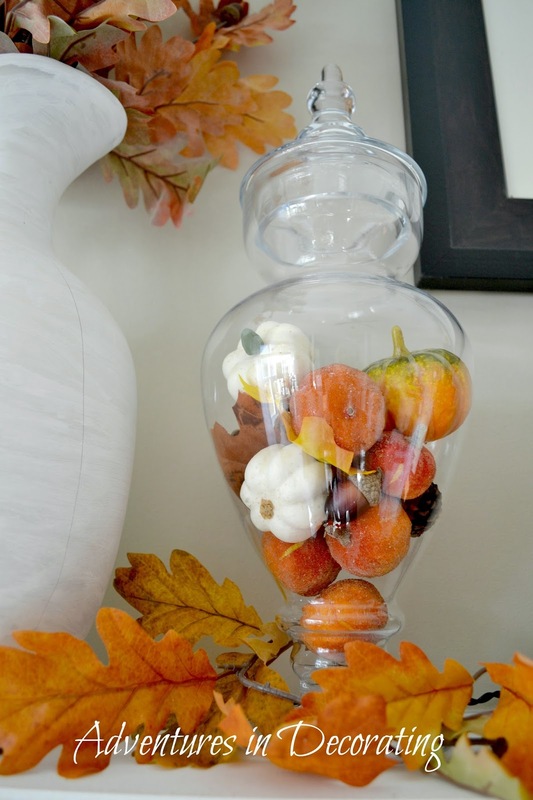 You have a knack for decorating for the holidays well. I love the little leaves you have hanging off your mantel too. Looks very nice! I just love fall and all that it entails. Enjoy! So pretty, Becca, as I knew it would be! Love that iron piece, too! I love the lights and the basket with the pillows and the throw. Just beautiful!!! You know I love everything you do Becca. This is beautiful!! I have to say the simple idea of the basket with the pillows and throw is my favorite. So glad you are enjoying your new home. Can't wait until we get the full tour!! There you go again, creating a beautiful mantelscape!! !...I love those adorable blocks!...and can't wait to see your kitchen makeover! 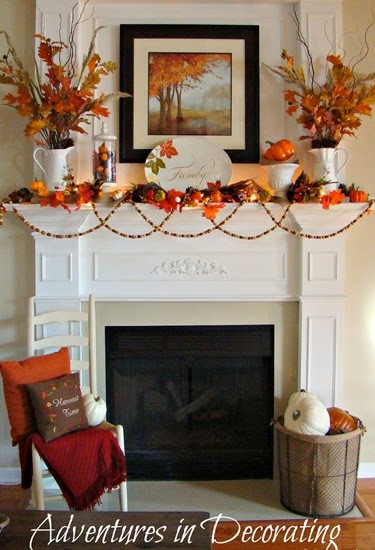 Becca, you have the best seasonal mantels! I always try to guess what you'll use in your seasonal design! You just amaze me! 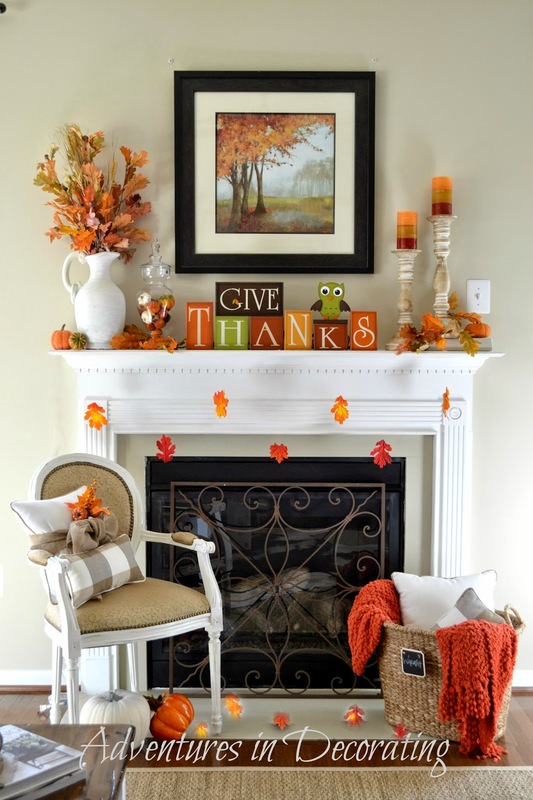 Your mantel is bright and just perfectly accessorized for Fall! Your hearth area is warm, cozy and inviting!Congratulations on the Country Living feature too! 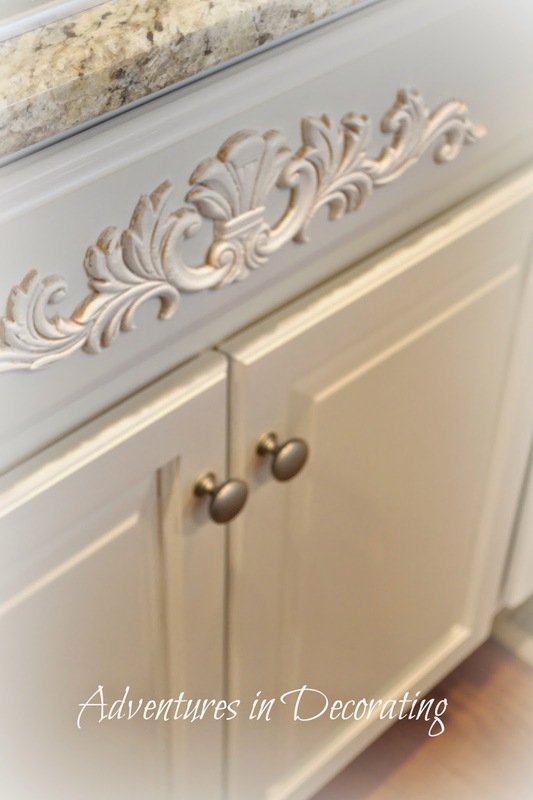 I love the white I'm seeing in your kitchen! You've been a busy girl! Becca, I always look forward to your mantles. They never disappoint. I started showing the new house. Becca, you don't do anything small or simple. Your decorating is simply fabulous... as are you dear! I'll be looking for your mantel!!!! Hugs! 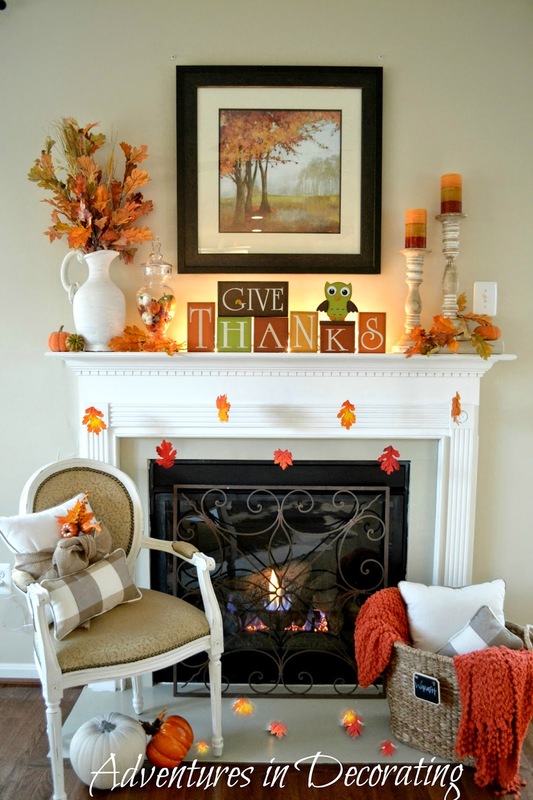 I always love to see how you decorate your mantles, they always look so pretty and beautifully put together. Can't wait to see your kitchen! Beautiful. What did you use for the back lighting? Thanks!